11 A None No Power Seat 11 A is a Royal Silk Business Class Bulkhead seat. Passengers with infants are often seated here. 11 B None No Power Seat 11 B is a Royal Silk Business Class Bulkhead seat. Passengers with infants are often seated here. 11 E None No Power Seat 11 E is a Royal Silk Business Class Bulkhead seat. Passengers with infants are often seated here. 11 F None No Power Seat 11 F is a Royal Silk Business Class Bulkhead seat. Passengers with infants are often seated here. 11 J None No Power Seat 11 J is a Royal Silk Business Class Bulkhead seat. Passengers with infants are often seated here. 11 K None No Power Seat 11 K is a Royal Silk Business Class Bulkhead seat. Passengers with infants are often seated here. 12 A None No Power Seat 12 A is a standard Royal Silk Business Class seat. 12 B None No Power Seat 12 B is a standard Royal Silk Business Class seat. 12 E None No Power Seat 12 E is a standard Royal Silk Business Class seat. 12 F None No Power Seat 12 F is a standard Royal Silk Business Class seat. 12 J None No Power Seat 12 J is a standard Royal Silk Business Class seat. 12 K None No Power Seat 12 K is a standard Royal Silk Business Class seat. 14 A None No Power Seat 14 A is a standard Royal Silk Business Class seat. 14 B None No Power Seat 14 B is a standard Royal Silk Business Class seat. 14 E None No Power Seat 14 E is a standard Royal Silk Business Class seat. 14 F None No Power Seat 14 F is a standard Royal Silk Business Class seat. 14 J None No Power Seat 14 J is a standard Royal Silk Business Class seat. 14 K None No Power Seat 14 K is a standard Royal Silk Business Class seat. 15 A None No Power Seat 15 A is a standard Royal Silk Business Class seat. 15 B None No Power Seat 15 B is a standard Royal Silk Business Class seat. 15 E None No Power Seat 15 E is a standard Royal Silk Business Class seat. 15 F None No Power Seat 15 F is a standard Royal Silk Business Class seat. 15 J None No Power Seat 15 J is a standard Royal Silk Business Class seat. 15 K None No Power Seat 15 K is a standard Royal Silk Business Class seat. 16 A None No Power Seat 16 A is a standard Royal Silk Business Class seat. 16 B None No Power Seat 16 B is a standard Royal Silk Business Class seat. 16 E None No Power Seat 16 E is a standard Royal Silk Business Class seat. 16 F None No Power Seat 16 F is a standard Royal Silk Business Class seat. 16 J None No Power Seat 16 J is a standard Royal Silk Business Class seat. 16 K None No Power Seat 16 K is a standard Royal Silk Business Class seat. 31 A None No Power Seat 31 A is an Economy Class Bulkhead seat. Proximity to the galley may be bothersome. The tray table is in the armrest, making the armrest immovable and slightly reducing seat width. There is no floor storage during take-off and landing. Passengers traveling with infants are often seated at this bulkhead. 31 B None No Power Seat 31 B is an Economy Class Bulkhead seat. Proximity to the galley may be bothersome. The tray table is in the armrest, making the armrest immovable and slightly reducing seat width. There is no floor storage during take-off and landing. Passengers traveling with infants are often seated at this bulkhead. 31 D None No Power Seat 31 D is an Economy Class Bulkhead seat. Proximity to the galley may be bothersome. The tray table is in the armrest, making the armrest immovable and slightly reducing seat width. There is no floor storage during take-off and landing. Passengers traveling with infants are often seated at this bulkhead. 31 E None No Power Seat 31 E is an Economy Class Bulkhead seat. Proximity to the lavatory and galley may be bothersome. The tray table is in the armrest, making the armrest immovable and slightly reducing seat width. There is no floor storage during take-off and landing. Passengers traveling with infants are often seated at this bulkhead. 31 F None No Power Seat 31 F is an Economy Class Bulkhead seat. Proximity to the lavatory and galley may be bothersome. The tray table is in the armrest, making the armrest immovable and slightly reducing seat width. There is no floor storage during take-off and landing. Passengers traveling with infants are often seated at this bulkhead. 31 J None No Power Seat 31 J is an Economy Class Bulkhead seat. Proximity to the lavatory and galley may be bothersome. The tray table is in the armrest, making the armrest immovable and slightly reducing seat width. There is no floor storage during take-off and landing. Passengers traveling with infants are often seated at this bulkhead. 31 K None No Power Seat 31 K is an Economy Class Bulkhead seat. Proximity to the lavatory and galley may be bothersome. The tray table is in the armrest, making the armrest immovable and slightly reducing seat width. There is no floor storage during take-off and landing. Passengers traveling with infants are often seated at this bulkhead. 32 C None No Power Seat 32 C has some extra room as there is no seat directly in front of you. However, this seat is frequently bumped during flight by passengers and service carts. The tray table is in the armrest, making the armrest immovable and slightly reducing seat width. There is no floor storage for this seat during take-off and landing. 32 H None No Power Seat 32 H has some extra room as there is no seat directly in front of you. However, this seat is frequently bumped during flight by passengers and service carts. The tray table is in the armrest, making the armrest immovable and slightly reducing seat width. There is no floor storage for this seat during take-off and landing. 32 K None No Power Seat 32 K is a standard Economy Class seat. 33 C None No Power Seat 33 C is a standard Economy Class seat. 33 K None No Power Seat 33 K is a standard Economy Class seat. 34 K None No Power Seat 34 K is a standard Economy Class seat. 35 K None No Power Seat 35 K is a standard Economy Class seat. 36 K None No Power Seat 36 K is a standard Economy Class seat. 37 C None No Power Seat 37 C is a standard Economy Class seat. 37 D None No Power Seat 37 D is a standard Economy Class seat. 37 K None No Power Seat 37 K is a standard Economy Class seat. 38 C None No Power Seat 38 C is a standard Economy Class seat. 38 D None No Power Seat 38 D is a standard Economy Class seat. 38 K None No Power Seat 38 K is a standard Economy Class seat. 39 C None No Power Seat 39 C is a standard Economy Class seat. 39 D None No Power Seat 39 D is a standard Economy Class seat. 39 K None No Power Seat 39 K is a standard Economy Class seat. 40 C None No Power Seat 40 C is a standard Economy Class seat. 40 D None No Power Seat 40 D is a standard Economy Class seat. 40 K None No Power Seat 40 K is a standard Economy Class seat. 41 B None No Power Seat 41 B is a standard Economy Class seat. 41 C None No Power Seat 41 C is a standard Economy Class seat. 41 D None No Power Seat 41 D is a standard Economy Class seat. 41 E None No Power Seat 41 E is a standard Economy Class seat. 41 F None No Power Seat 41 F is a standard Economy Class seat. 41 H None No Power Seat 41 H is a standard Economy Class seat. 41 K None No Power Seat 41 K is a standard Economy Class seat. 42 A None No Power Seat 42 A is a standard Economy Class seat. 42 B None No Power Seat 42 B is a standard Economy Class seat. 42 C None No Power Seat 42 C is a standard Economy Class seat. 42 D None No Power Seat 42 D is a standard Economy Class seat. 42 E None No Power Seat 42 E is a standard Economy Class seat. 42 F None No Power Seat 42 F is a standard Economy Class seat. 42 H None No Power Seat 42 H is a standard Economy Class seat. 42 J None No Power Seat 42 J is a standard Economy Class seat. 42 K None No Power Seat 42 K is a standard Economy Class seat. 43 A None No Power Seat 43 A is a standard Economy Class seat. 43 B None No Power Seat 43 B is a standard Economy Class seat. 43 C None No Power Seat 43 C is a standard Economy Class seat. 43 D None No Power Seat 43 D is a standard Economy Class seat. 43 E None No Power Seat 43 E is a standard Economy Class seat. 43 F None No Power Seat 43 F is a standard Economy Class seat. 43 H None No Power Seat 43 H is a standard Economy Class seat. 43 J None No Power Seat 43 J is a standard Economy Class seat. 43 K None No Power Seat 43 K is a standard Economy Class seat. 44 A None No Power Seat 44 A is a standard Economy Class seat. 44 B None No Power Seat 44 B is a standard Economy Class seat. 44 C None No Power Seat 44 C is a standard Economy Class seat. 44 D None No Power Seat 44 D is a standard Economy Class seat. 44 E None No Power Seat 44 E is a standard Economy Class seat. 44 F None No Power Seat 44 F is a standard Economy Class seat. 44 H None No Power Seat 44 H is a standard Economy Class seat. 44 J None No Power Seat 44 J is a standard Economy Class seat. 44 K None No Power Seat 44 K is a standard Economy Class seat. 45 A None No Power Seat 45 A is a standard Economy Class seat. 45 B None No Power Seat 45 B is a standard Economy Class seat. 45 C None No Power Seat 45 C is a standard Economy Class seat. 45 D None No Power Seat 45 D is a standard Economy Class seat that may have limited under seat leg and storage room due to the presence of an entertainment equipment box. 45 E None No Power Seat 45 E is a standard Economy Class seat. 45 F None No Power Seat 45 F is a standard Economy Class seat. 45 H None No Power Seat 45 H is a standard Economy Class seat. 45 J None No Power Seat 45 J is a standard Economy Class seat. 45 K None No Power Seat 45 K is a standard Economy Class seat. 46 A None No Power Seat 46 A is a standard Economy Class seat. 46 B None No Power Seat 46 B is a standard Economy Class seat. 46 C None No Power Seat 46 C is a standard Economy Class seat. 46 D None No Power Seat 46 D is a standard Economy Class seat. 46 E None No Power Seat 46 E is a standard Economy Class seat. 46 F None No Power Seat 46 F is a standard Economy Class seat. 46 H None No Power Seat 46 H is a standard Economy Class seat. 46 J None No Power Seat 46 J is a standard Economy Class seat. 46 K None No Power Seat 46 K is a standard Economy Class seat. 47 C None No Power Seat 47 C is a standard Economy Class seat. 47 D None No Power Seat 47 D is a standard Economy Class seat. 47 E None No Power Seat 47 E is a standard Economy Class seat. 47 F None No Power Seat 47 F is a standard Economy Class seat. 47 H None No Power Seat 47 H is a standard Economy Class seat. 48 A None No Power Seat 48 A is an Economy Class seat, however this seat may not recline due to the wall behind. Close proximity to the lavatory may be bothersome as passengers tend to congregate in the area behind this seat. 48 B None No Power Seat 48 B is an Economy Class seat, however this seat may not recline due to the wall behind. Close proximity to the lavatory may be bothersome as passengers tend to congregate in the area behind this seat. 48 C None No Power Seat 48 C is an Economy Class seat, however this seat may not recline due to the wall behind. Close proximity to the lavatory may be bothersome as passengers tend to congregate in the area behind this seat. 48 D None No Power Seat 48 D is a standard Economy Class seat. 48 E None No Power Seat 48 E is a standard Economy Class seat. 48 F None No Power Seat 48 F is a standard Economy Class seat. 48 H None No Power Seat 48 H is an Economy Class seat, however this seat may not recline due to the wall behind. Close proximity to the lavatory may be bothersome as passengers tend to congregate in the area behind this seat. 48 J None No Power Seat 48 J is an Economy Class seat, however this seat may not recline due to the wall behind. Close proximity to the lavatory may be bothersome as passengers tend to congregate in the area behind this seat. 48 K None No Power Seat 48 K is an Economy Class seat, however this seat may not recline due to the wall behind. Close proximity to the lavatory may be bothersome as passengers tend to congregate in the area behind this seat. 49 D None No Power Seat 49 D is an Economy Class seat, however this seat may not recline due to the wall behind. Close proximity to the lavatory may be bothersome as passengers tend to congregate in the area behind this seat. 49 E None No Power Seat 49 E is an Economy Class seat, however this seat may not recline due to the wall behind. Close proximity to the lavatory may be bothersome as passengers tend to congregate in the area behind this seat. 49 F None No Power Seat 49 F is an Economy Class seat, however this seat may not recline due to the wall behind. Close proximity to the lavatory may be bothersome as passengers tend to congregate in the area behind this seat. 50 A None No Power Seat 50 A is an Economy Class Exit Row seat which has extra space, though some of your legroom is impeded by the slide that protrudes from the exit door and you may have to angle your legs to fully stretch them. Proximity to the lavatories may be bothersome as as passengers tend to congregate in this area during flight. The tray table is in the armrest, making the armrest immovable and slightly reducing seat width. There is no floor storage for this seat during take-off and landing. 50 B None No Power Seat 50 B is an Economy Class Exit Row seat with extra legroom. Proximity to the lavatories may be bothersome as passengers tend to congregate in this area during flight. The flight attendant seat is directly across from this row and you'll have to share your foot space during take-off and landing. The tray table is in the armrest, making the armrest immovable and slightly reducing seat width. There is no floor storage for this seat during take-off and landing. 50 C None No Power Seat 50 C is an Economy Class Exit Row seat with extra legroom. Proximity to the lavatories may be bothersome as passengers tend to congregate in this area during flight. The flight attendant seat is directly across from this row and you'll have to share your foot space during take-off and landing. The tray table is in the armrest, making the armrest immovable and slightly reducing seat width. There is no floor storage for this seat during take-off and landing. 50 D None No Power Seat 50 D is an Economy Class Bulkhead seat. Proximity to the lavatories may be bothersome. There is no floor storage during takeoff and landing. The tray table is in the armrest, making the armrest immovable and slightly reducing seat width. Passengers with infants are usually seated here. 50 E None No Power Seat 50 E is an Economy Class Bulkhead seat. Proximity to the lavatories may be bothersome. There is no floor storage during takeoff and landing. The tray table is in the armrest, making the armrest immovable and slightly reducing seat width. Passengers with infants are usually seated here. 50 F None No Power Seat 50 F is an Economy Class Bulkhead seat. Proximity to the lavatories may be bothersome. There is no floor storage during takeoff and landing. The tray table is in the armrest, making the armrest immovable and slightly reducing seat width. Passengers with infants are usually seated here. 50 H None No Power Seat 50 H is an Economy Class Exit Row seat with extra legroom. Proximity to the lavatories may be bothersome as passengers tend to congregate in this area during flight. The flight attendant seat is directly across from this row and you'll have to share your foot space during take-off and landing. The tray table is in the armrest, making the armrest immovable and slightly reducing seat width. There is no floor storage for this seat during take-off and landing. 50 J None No Power Seat 50 J is an Economy Class Exit Row seat with extra legroom. Proximity to the lavatories may be bothersome as passengers tend to congregate in this area during flight. The flight attendant seat is directly across from this row and you'll have to share your foot space during take-off and landing. The tray table is in the armrest, making the armrest immovable and slightly reducing seat width. There is no floor storage for this seat during take-off and landing. 50 K None No Power Seat 50 K is an Economy Class Exit Row seat which has extra space, though some of your legroom is impeded by the slide that protrudes from the exit door and you may have to angle your legs to fully stretch them. Proximity to the lavatories may be bothersome as as passengers tend to congregate in this area during flight. The tray table is in the armrest, making the armrest immovable and slightly reducing seat width. There is no floor storage for this seat during take-off and landing. 51 F None No Power Seat 51 F is a standard Economy Class seat. 52 F None No Power Seat 52 F is a standard Economy Class seat. 53 F None No Power Seat 53 F is a standard Economy Class seat. 54 F None No Power Seat 54 F is a standard Economy Class seat. 55 F None No Power Seat 55 F is a standard Economy Class seat. 56 F None No Power Seat 56 F is a standard Economy Class seat. 57 F None No Power Seat 57 F is a standard Economy Class seat. 58 F None No Power Seat 58 F is a standard Economy Class seat. 59 C None No Power Seat 59 C is an Economy Class seat that juts into the aisle and is often bumped by service carts and other passengers during flight. 59 F None No Power Seat 59 F is a standard Economy Class seat. 59 H None No Power Seat 59 H is an Economy Class seat that juts into the aisle and is often bumped by service carts and other passengers during flight. 60 A None No Power Seat 60 A is an Economy Class seat that has restricted legroom because of the transition from 3 seats across to 2 seats across. While you have some extra storage space, you'll have to maneuver your legs around the extra seat anchors. 60 B None No Power Seat 60 B is an Economy Class seat that has restricted legroom because of the transition from 3 seats across to 2 seats across. While you have some extra storage space, you'll have to maneuver your legs around the extra seat anchors. 60 F None No Power Seat 60 F is a standard Economy Class seat. 60 J None No Power Seat 60 J is an Economy Class seat that has restricted legroom because of the transition from 3 seats across to 2 seats across. While you have some extra storage space, you'll have to maneuver your legs around the extra seat anchors. 60 K None No Power Seat 60 K is an Economy Class seat that has restricted legroom because of the transition from 3 seats across to 2 seats across. While you have some extra storage space, you'll have to maneuver your legs around the extra seat anchors. 61 A None No Power Seat 61 A is a standard Economy Class seat. 61 B None No Power Seat 61 B is a standard Economy Class seat. 61 D None No Power Seat 61 D is a standard Economy Class seat. 61 E None No Power Seat 61 E is a standard Economy Class seat. 61 F None No Power Seat 61 F is a standard Economy Class seat. 61 J None No Power Seat 61 J is a standard Economy Class seat. 62 A None No Power Seat 62 A is a standard Economy Class seat. 62 B None No Power Seat 62 B is a standard Economy Class seat. 62 D None No Power Seat 62 D is a standard Economy Class seat. 62 E None No Power Seat 62 E is a standard Economy Class seat. 62 F None No Power Seat 62 F is a standard Economy Class seat. 62 J None No Power Seat 62 J is located in the last row of Economy Class and may have limited recline due to the wall behind. Proximity to the lavatory and galley may be bothersome as passengers tend to congregate in this area. 62 K None No Power Seat 62 K is located in the last row of Economy Class and may have limited recline due to the wall behind. Proximity to the lavatory and galley may be bothersome as passengers tend to congregate in this area. 63 A None No Power Seat 63 A is located in the last row of Economy Class and may have limited recline due to the wall behind. Proximity to the lavatory and galley may be bothersome as passengers tend to congregate in this area. 63 B None No Power Seat 63 B is located in the last row of Economy Class and may have limited recline due to the wall behind. Proximity to the lavatory and galley may be bothersome as passengers tend to congregate in this area. 63 D None No Power Seat 63 D is located in the last row of Economy Class and may have limited recline due to the wall behind. Proximity to the lavatory and galley may be bothersome as passengers tend to congregate in this area. 63 E None No Power Seat 63 E is located in the last row of Economy Class and may have limited recline due to the wall behind. Proximity to the lavatory and galley may be bothersome as passengers tend to congregate in this area. 63 F None No Power Seat 63 F is located in the last row of Economy Class and may have limited recline due to the wall behind. Proximity to the lavatory and galley may be bothersome as passengers tend to congregate in this area. Business Class seats have a wide selection fo audio choices on the AVOD entertainment system. Economy Class seats offer audio selections on a loop system. All seats offer a 10.4-inch AVOD personal AVOD TV screen. There are 110v AC power ports at all seats on this aircraft. 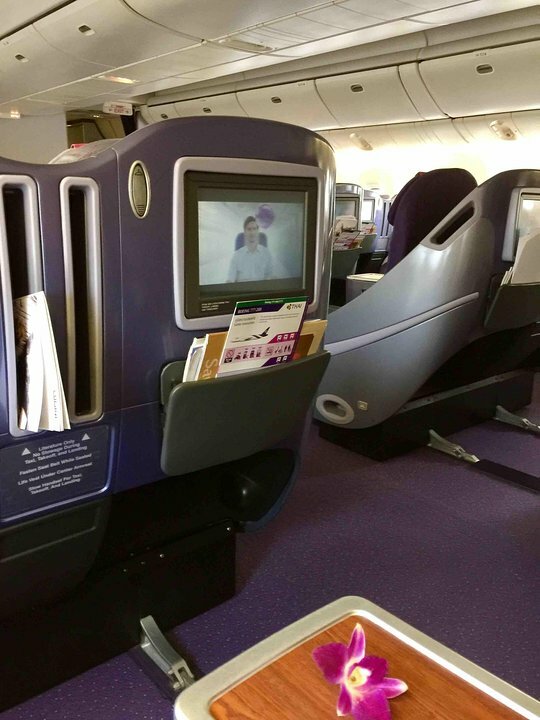 On all international flights, complimentary beverage and meal service is offered in all classes. 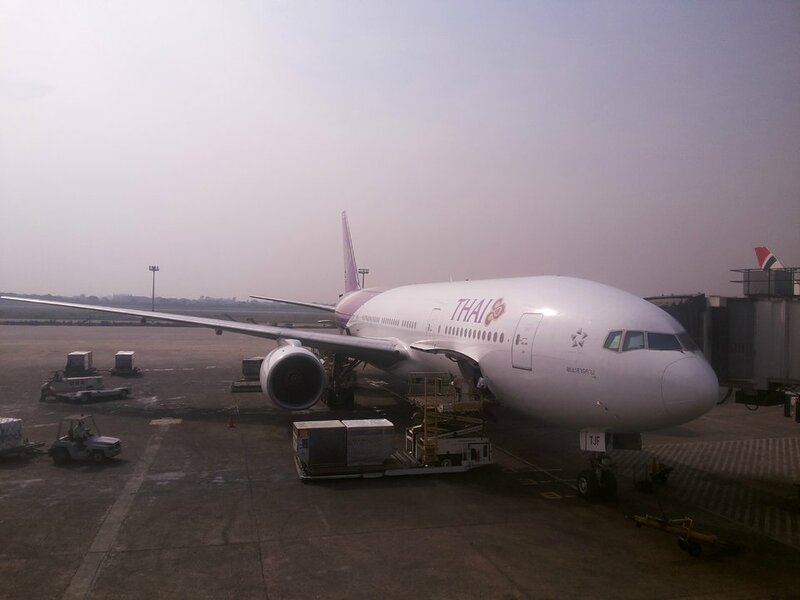 Thai's B777-200 aircraft offers two classes of service: Royal Silk Business and Economy. All seats on this aircraft are fitted with 110-volt AC power ports. electrical device is under front seat. very narrow leg space. Business class BKK to Dubai. This plane is way out of date compared to modern offerings. A tired interior and an uncomfortable seat that does not fully recline. Poor food and entertainment. Crew pleasant but the service is disjointed. 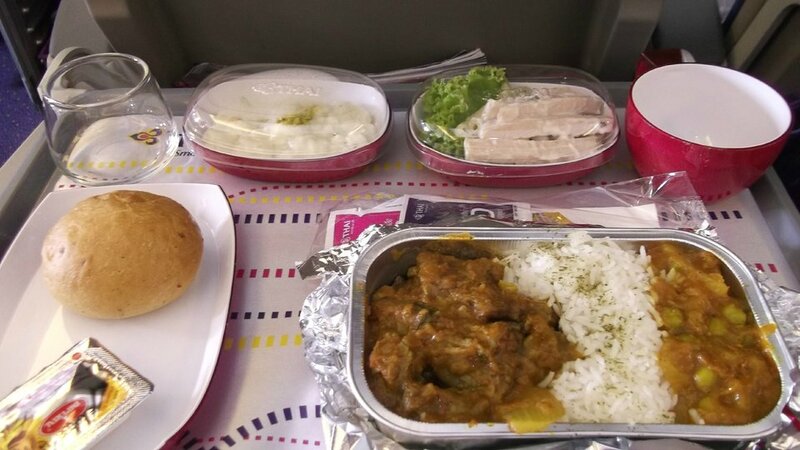 I took this flight for business; the overall product is poor and I would not recommend Thai in this aircraft unless like me, you needed to use it because of timings. Business cabin feels spacious, mainly due to very inefficient use of space - 6 abreast only, and surprisingly narrow seats - Results in the dead-space aisles being Massive. For shorthaul which this jet is mostly used on, could've easily upped payload with another column of seating, or given passengers an extra inch or two of rear-end wriggle. Direct flight BKK to Melbourne. Don't choose this seat. There is a large box installed under 38H that prohibits you from putting your feet under the seat. There is a slim area on the left to slide left foot in without a shoe on. Nowhere to slide carry on bag either. Very uncomfortable trip. Seat Guru list this as a normal economy seat. It's not; it is a bad seat and should be marked red. Thai should discount the price of seats like this. They are not providing what you pay for. Will examine other airlines for next trip. I fly this route TG 624/625 at least once a month and TG uses older aircraft that are basically ok for seating economy 3 hours. entertainment system did not work last flight (Manila - Bkk leg 8th June). aircon did work freezingly well on that flight. wear a jacket. This B777-200 (HS-TJW) is an old and tired plane in general. The entertainment units are small and very hard to see. The last seats 62 J&K do have recline, but the toilet flushing immediately behind is very noisy. Entertainment boxes under the seats greatly limit foot space and made the flight extremely uncomfortable. I would prefer to use another airline than experience this aircraft again. Had seat 12K from BKK-AKL. Leg rest would not hold the weight of my legs and leg rest turned into more of a recliner chair than bed. I had to put my carry on underneath the leg rest in order for it to not bend down. Even still, don't believe that they are 170 degree angle flats. I was no where near maybe 150 degrees. Boeing 777/200: business class resp. Silk class is in this machine a better coach class! You can't really sleep, because the seats are not 180 degree flat. I. Didn't like it at all! Worst business class seat I have ever experienced. Hard, worn out, lumpy seat that only reclines to around 160 degrees. 1m wide aisles and a very narrow seat don't make sense TG. Very poor value for money from a "Premium" airline. Disappointed immensely. I would avoid this seat. There is a very large entertainment box (the biggest I have experienced) taking up almost all the footspace under the seat in front. There is a slim space, about 10cm wide, at the left of the box, where you might be able to squeeze one foot. 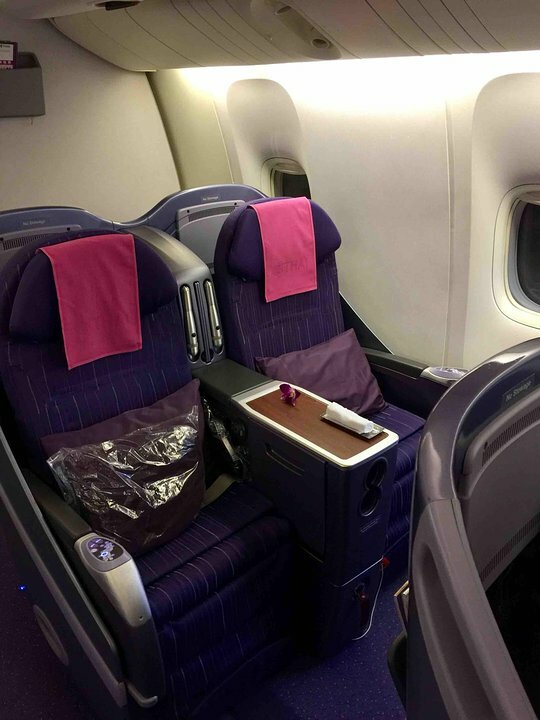 If you have saved your money to fly business class, well forget this Airline the seats are not comfortable at all and the service is average to say the least. All K-seats (window) from row 32 onwards are highly uncomfortable due to the entertainment box which is located under those seats. The legs cannot be stretched under the seat in front. For the 2 seats format, it is considered more spacious considered those 3 seats format. 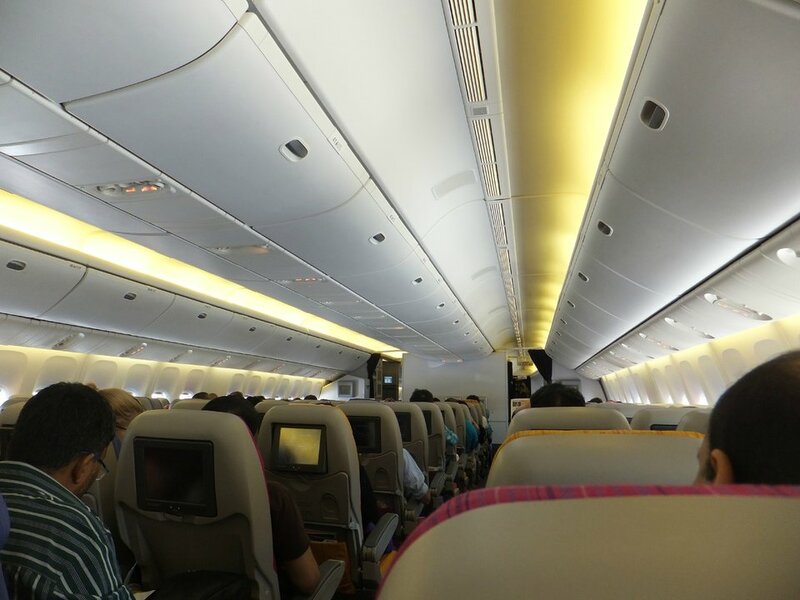 However, should the passenger infront of you incline their seat backward to the maximum, you will have trouble viewing your inflight entertainment screen. The worst business class in the air and the most uncomfortable seat, and that's really saying something. Forget sleep, forget comfort. Only an airline as arrogant as Thai could charge premium prices for a business class seat that is at least three generations out of date. This is not a real angle-flat seat. The bottom part of the seat drops down just below where ones knees are and leaves the legs painfully dangling. Sleep is impossible!! Worst business class seat I have encountered! THAI flies 1 versions of Thai Airways Boeing 777-200(772).